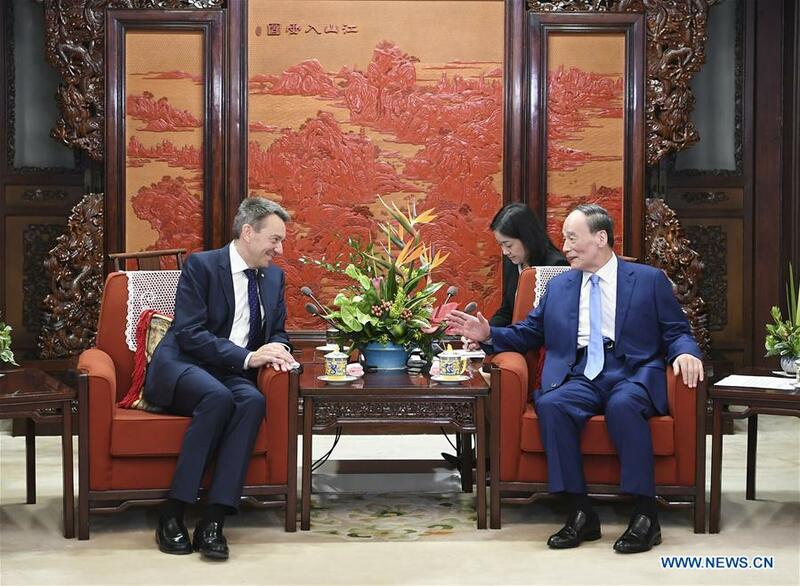 Chinese Vice President Wang Qishan on Wednesday met with the International Committee of the Red Cross (ICRC) President Peter Maurer, pledging to firmly support the ICRC humanitarian cause. Wang said the ICRC made positive contributions to protecting human life and health as well as promoting world peace and development. However, the current humanitarian situation in the world remains grim, he said. Wang called on the international community to enhance humanitarian assistance, and developed countries, in particular, to substantially fulfill their obligations on assistance. He said the Chinese government would, as always, support the ICRC humanitarian cause, and encourage the Red Cross Society of China to enhance practical cooperation with the International Red Cross under the framework of the Belt and Road Initiative. For his part, Maurer hailed China's contribution to the international humanitarian cause and said he appreciated China's support for the ICRC. He expressed hopes to deepen cooperation with Chinese side in various areas including the construction of the Belt and Road.